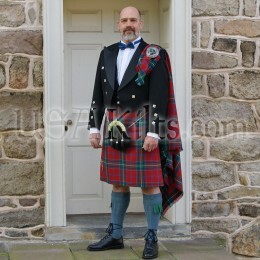 Determining what the groom will wear for a kilted wedding is not as hard as you might think. After his outfit is designed, the rest of the details of the wedding are very flexible. Which Kilt is Right for my Wedding? Eight-yard kilt: An heirloom kilt. 8-yard kilts have the best swing when you walk, and look the most impressive. 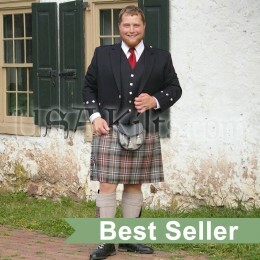 Five-yard kilt: A “day kilt” which was standard until the Victorians invented the eight yard. Still looks great, just not as much “swish” when you walk or dance. A good option for warmer climates. Semi-Traditional kilt: Our original hybrid of tradition with modern convenience - built like our five-yard, but using a lightweight, machine washable and hypoallergenic fabric. 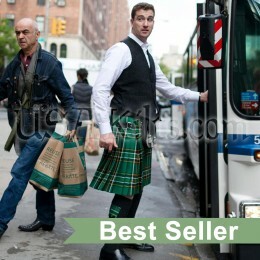 A very sharp kilt you can dress up, but also very affordable if you are on a tight budget. 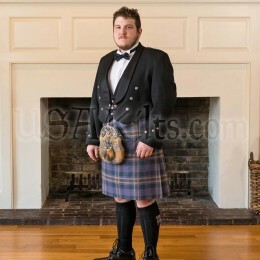 Any of the kilts listed above can be part of a complete “package” from USA Kilts. How Do I Complete My Kilt Outfit? How formal or informal would you like your wedding to be? What you wear on your top half will really set the tone for the occasion. It’s also an important way to express your personal style. Jackets, vests, neckties, etc. are all things to consider. We’ve broken it down for you here. 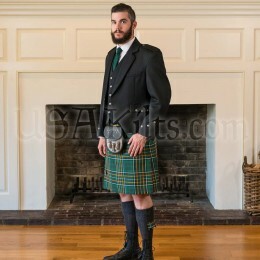 Each link will lead you to a customizable Kilt Package which shows options and examples. 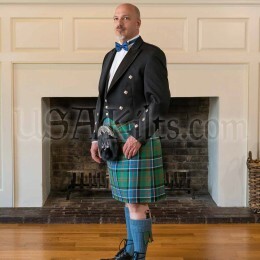 Packages allow you to get a complete head-to-toe outfit -- a kilt and all the accessories -- at a 10% discount! A Prince Charlie Jacket & Vest paired with a bow tie is good for a formal black tie affair such as an evening wedding, church wedding, Scottish castle wedding, etc. The Prince Charlie is essentially the Scottish tuxedo. A Fly Plaid is a good option for this look. An Argyll Jacket & Vest paired with a ruche tie is a bit more formal where pairing it with a standard necktie makes it the equivalent of a nice suit. It’s good for formal or semi-formal weddings, perhaps a Victorian-themed wedding. It will be a versatile jacket for you to wear years after you’ve said your vows. A Fly Plaid is a good option for this look. A Tweed Jacket & Vest paired with a necktie gives a nice, earthy feel which is elegant, but not too formal. Good for a daytime wedding, an outdoor wedding, autumn wedding or barn wedding. A Fly Plaid is a good option, but not essential for this look. A Chieftain's Vest paired with a cream or black Highland Shirt (also known as a Jacobite or ghillie shirt) creates a dashing look for any wedding with a theme such as rustic, historical, renaissance, Outlander, medieval or fantasy. This look is especially popular for pagan weddings. A Day Plaid is a good option for this look. An Argyll Vest, usually worn with a white dress shirt and perhaps a tie, is an easy way to dress up your look just a bit without going formal. Check out our Pub Package (which includes the vest as a shirt option). The “kilt and vest” look is low-key and natural. Great for any "back to basics" theme like a beach wedding, backyard wedding or destination wedding. What is a Sporran and Why is It Important for My Wedding? Dress Sporrans are typically worn with a Prince Charlie or Argyll. They’re usually reserved for formal & black tie kilt weddings. Semi Dress Sporrans are kind of a hybrid of the Dress Sporran and the Day Sporran. They have a fur front with tassels, but have a leather flap opening at the top. They’re well paired with an Argyll or Tweed or Highlander package. Day Sporrans are a bit more simplistic. They are all leather and are typically worn for day, casual, beach or rustic Celtic weddings. They go nicely with our Tweed, highlander or pub packages. Below, you'll find some of the items we discussed in the sections above. The wonderful thing about Highland Wear is that you can make it your own. You can dress your wedding kilt up or down, depending on which accessories you choose. For more guidance on how to put together a kilt outfit to suit your personality and achieve the look you desire for your Irish or Scottish wedding theme, please feel free to contact us for guidance or assistance.